Sunny Ledgend put in an excellent round of jumping to floor his four rivals in the 2m 4f handicap chase at Towcester on Thursday. The 11-year-old had not won for more than three years but recorded his fourth career success from 33 starts when coming home by two lengths from Cloudy Bob at odds of 12/1. His trainer Andrew Martin who looks after seven horses at Yew Tree Barn, Swerford near Chipping Norton, has been a racecourse farrier at Towcester since last year, but was off duty to allow him to prepare the winner. The horse was ridden by Martin’s son James who is following in his father’s footsteps as an apprentice farrier and his partnership with Sunny Ledgend (he has now been on board for the horse’s last 23 outings) has helped to hone his skills in the saddle. Trainer Kerry Lee has been capturing headlines thanks to the form of her horses on the Welsh borders at Presteigne in her first season as a licence holder but it was her father Richard who represented the stables with three runners on a card which saw 38 horses go to post in six contests. 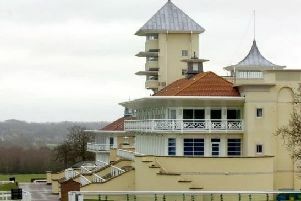 The Lee family has been regular visitors to Towcester over the years, earning a reputation for staying chasers such as Victory Gunner, Marked Man and Welsh Grand National winner Le Beau Bai. They hope to send out another winner of that gruelling slog on Saturday in the form of Mountainous, successful two years ago, and Mr Bachster confirmed the well-being of the yard by jumping and galloping to a smooth success in the opening 2m handicap chase, under Jamie Moore. Like Sunny Ledgend, Mr Bachster is an 11 year-old who was returned at 12/1 but he was returning to form after a switch back to fences from hurdles, while his previous chase defeat came when a plan to run him again quickly at Lingfield on the back of a victory at Fontwell, badly backfired. Elsewhere on the Towcester card, Welsh trainer Debra Hamer sent out a 20/1 bumper winner in the form of Billy Bronco while respected Towcester trainers Venetia Williams and Kim Bailey both enhanced their reputations on these shores by picking up prizes with Eminent Poet (4/5) in the 2m handicap hurdle and Pulling Power (11/10 joint favourite) in the 2m maiden hurdle. Black Narcissus (2/1) took the 2m 4f novices’ handicap chase for trainer Alexandra Dunn and jockey Rhys Flint.